Reviews | Tennis Tour Packages - Steve Furgal's International Tennis Tours ~ Experience a Tennis Trip of a Lifetime! "My trip to the Australian Open was certainly one of my most memorable tours in over 30 years in the travel business! Now I know why I have such satisfied clients whenever I book them on your trips. Absolute perfection in every aspect." We wanted to let you know that we had a wonderful time on the Australian Open trip! We enjoyed every excursion, hotel and dinner that was planned, and felt that the trip was extremely well organized and a lot of fun! We also appreciated how gracious and helpful you both were and look forward to travelling again with you in the future. I just wanted to say how well things went at Roland Garros. We had never attended a major tennis event before... Everything went fantastic, from the initial ordering to all the instructions you supplied both before and after we received our tickets. The seats were excellent and the hospitality area was a welcome break from the heat as well. I just wanted to take the opportunity to tell you how impressed we were and hope the opportunity occurs for us to travel with you again. Thank you so much for organizing your recent Wimbledon trip! My wife and I had such a great time at Wimbledon and in London. We appreciate the attention to details and luxury of your packages... Hopefully we can take in the French and Australian Opens soon! Just wanted to say "thank you" for always providing us with terrific tennis tickets and wonderful accommodations. We really appreciate the excellent service you provide and look forward to booking future tennis vacations with you. Just wanted to thank Steve and Anne for organizing a spectacular Shanghai Masters trip. The trip was very enjoyable and very well planned out and organized... accommodations and service were impeccable. I'm looking forward to joining you on many more such fabulous trips. Steve and all, thanks again for another great trip. Our first Wimbledon experience was unforgettable. Top notch all the way. Thanks again for consistently delivering top quality on these trips. We have just arrived home and are still glowing from our trip. It really was a wonderful exprience. Thank you so much for having everything planned so perfectly! The accommodations were unbelievable as were the seats for the matches in Rod Laver. Thanks again for such a special trip. A short thank you note for the excellent organisation and seamless implementation of all aspects of our visit to Wimbledon. Seldom have we experienced such a trouble free implementation of a travel itinerary from pick up to drop off and every part in between. We were most imporessed with the care and attention we received and the attention to the smallest of details. The trip exceeded our expectations and we will certainly be looking forward to using your excellent services again in the future. 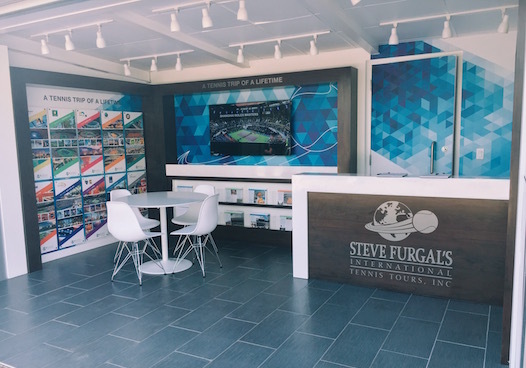 I know that if my journalistic duties didn't take me to the major Championships, I'd want to get there with Tennis Tours by Steve Furgal: letting them take care of all the details in their inimitable style.